Alemán, a member of the UO’s Center for Optical, Molecular, and Quantum Science, has engineered artificial atoms that function in ambient environments. The study, published in the journal Nano Letters, could be a major step in efforts to boost secure quantum communication networks and all-optical quantum computing. The big breakthrough is that we’ve discovered a simple, scalable way to nanofabricate artificial atoms onto a microchip, and that the artificial atoms work in air and at room temperature. Our artificial atoms will enable lots of new and powerful technologies. In the future, they could be used for safer, more secure, totally private communications, and much more powerful computers that could design life-saving drugs and help scientists gain a deeper understanding of the universe through quantum computation. Ben Alemán, Physicist, Materials Science Institute and Center for Optical, Molecular, and Quantum Science, UO. Joshua Ziegler, a doctoral student researcher in Alemán’s lab, and colleagues drilled holes—500 nm wide and 4 nm deep—into a thin 2D sheet of hexagonal boron nitride, which is also termed as white graphene due to its white color and atomic thickness. To drill the holes, the researchers used a process that is similar to pressure-washing, but instead of a water jet they employed a focused beam of ions to etch circles into the white graphene. They then heated the material in oxygen at high temperatures to eliminate residues. Ziegler, using optical confocal microscopy, subsequently observed minute spots of light emanating from the drilled areas. After examining the light with photon counting methods, he learned that the individual bright spots were discharging light at the lowest possible level—one photon at a time. These patterned bright spots are artificial atoms and they have a number of the same properties of real atoms, such as single photon emission. With the triumph of the project, Alemán said, the UO is currently ahead in the race to create such materials in quantum research. This brings cheer to Alemán. When he entered the UO in 2013, he had planned to follow the idea that artificial atoms could be formed in white graphene. However, before Alemán could begin his own research, another university team detected artificial atoms in flakes of white graphene. Alemán then aimed to develop on that discovery. 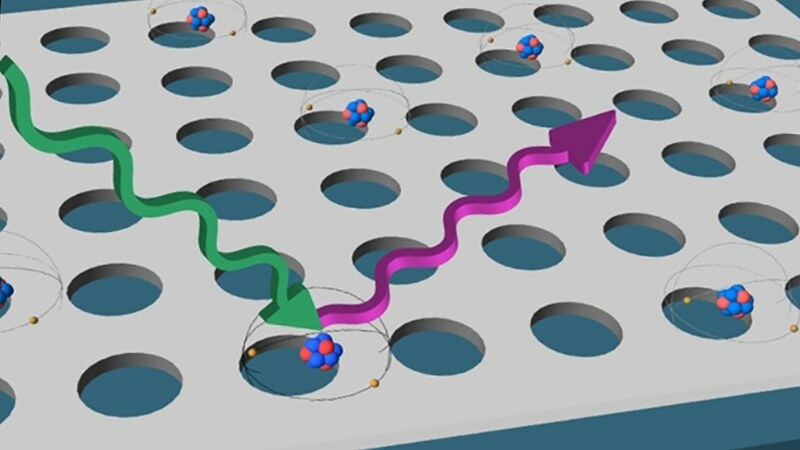 Fabricating the artificial atoms is the main step towards utilizing them as sources of single particles of light in quantum photonic circuits, he stated. Our work provides a source of single photons that could act as carriers of quantum information or as qubits. We’ve patterned these sources, creating as many as we want, where we want. We’d like to pattern these single photon emitters into circuits or networks on a microchip so they can talk to each other, or to other existing qubits, like solid-state spins or superconducting circuit qubits. Ben Alemán, Physicist, Materials Science Institute, and Center for Optical, Molecular, and Quantum Science UO. Co-authors on the paper are UO doctoral students Joshua Ziegler, Rachael Klaiss, Andrew Blaikie and David Miller, and Viva Horowitz, a professor of physics at Hamilton College in New York, who spent summer 2018 in Alemán’s lab as a visiting professor. The National Science Foundation-supported research was carried out in Alemán’s lab, the UO’s Center for Advanced Materials Characterization in Oregon and the Oregon Rapid Materials Prototyping Facility. The latter was set up in 2016 by an award from the M. J. Murdock Charitable Trust.